[13:39:36] Fens: I CANT LOG IN IT JUST SAID?? that ive exceeded my subscription limit when i literally have 0 poses, 0 rooms and 0 objects??? "this all seems like a dream, please don’t disappear. Yooo,I am having this problem where it says 'Exceeded Pose Limit' and it will not let me upgrade or anything,I have enough deltas,but even a user that is using Internet Explorer is having these troubles. oh.. didn't even realize this existed, lol. my bad. yeaaa I'm experiencing the same issue on ALL accounts. Not just ones that had poses. I first was asked to delete my current ones as I'm assuming my deltas ran out, sent em to a friend and I came back to that and now it will not allow me to log into any of my accounts, regardless of deltas or chatsite. 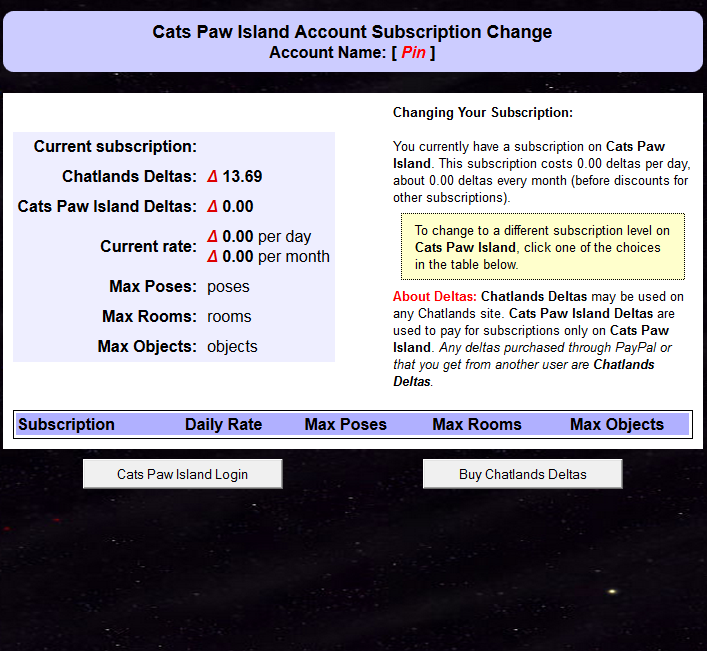 I even tried logging in through the chatlands homepage and it just 'refreshes' instead of logging me in. @diethyl, the same thing is happening to me. I log in and it sends me right back to the log in screen. But, I'm able to log in now; but not able to upgrade my subscription. It just remains blank. [size=13]I believe all chatlands are experiencing the same problem. UD was emailed by Takatia on WH so hopefully it's resolved quickly. That's odd, it's worked for a few other people D: and I just lost connection with the server. Looks like it got fixed! Everything is working except the chat is a tad laggy. to get the # of users in the chatroom right. When I 'click to continue' it goes to the chatwitch page and nothing changes when I relog. Try clearing your cache and/or trying another browser. That's a server issue that a few users on other sites are experiencing. Maybe change the browser you're using? So apparently I found out (by another admin, and not UD himself), that ud is switching the chatlands to a different server. "Sorry, but CHATLANDS is offline again now due to continuing problems from the database server crash. Further updates to the situation will appear at this page.